Two Wits students have started a laundry service for the Wits community and residents in surrounding areas. 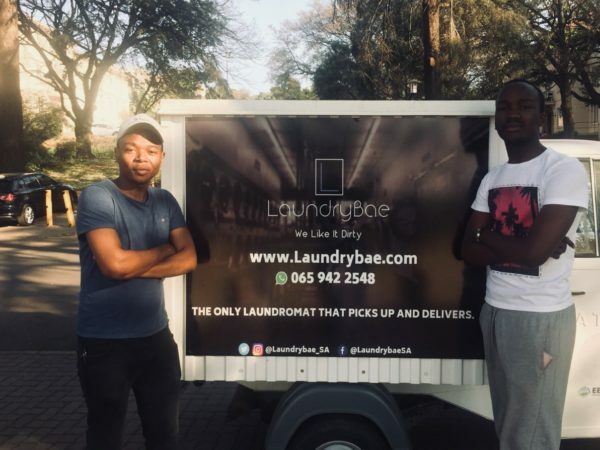 Two Wits students have started a laundry service, LaundryBae, to serve the Wits community and residents in Braamfontein, Melville and Auckland Park. Originally launched in May, the service was held back due to university holidays and minor setbacks in getting the business going. For example, the owners struggled to acquire the vehicle used for pick-ups and deliveries, and to find a suitable team for the business. Quantity surveying honours student, Sizwe Bhengu, said that running LaundryBae isn’t easy and has come with challenges. “It has been a huge learning curve but we have welcomed all the challenges and managed to fix the issues we had,” the 22-year-old said. Bhengu told Wits Vuvuzela that he and his partner, Glen Mabunda, a fourth-year mining engineering student, saw a gap in the market. “A lot of people don’t have time, and we wanted to introduce a service where with the touch of a message, your laundry can be picked up and cleaned for you,” Bhengu added. CLEANING UP: The co-founders of LaundryBae. Mabunda entered the Agis Holdings and Wits Business School Entrepreneurship Competition in 2017. Out of 84 entries, he scored first place and won R75 000. Mabunda used this money to start the business with Bhengu. Mabunda said that the idea came from his own struggles of being a student and not having time to do laundry. Auckland Park resident and second-year BCom Accounting student at Wits, Mbali Zulu, said that she had many commitments as a student and had no time to do laundry. Each laundry item is charged individually with prices ranging from R50 for shoes to R150 for a full men’s suit. Clients can contact the business through its website (http://laundrybae.com/). The laundry is then picked up from the customer, laundered or dry-cleaned, and returned to the customer within 24 hours.